Adaeulum sp., copyright Charles Haddad. The Triaenonychidae are the family of Gondwanan harvestmen. 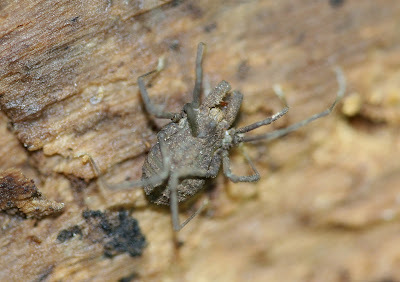 While there are other families of harvestmen with a Gondwanan distribution (such as my own favoured family, the Neopilionidae), none of them are nearly as widespread and diverse as the triaenonychids. Despite their diversity, however, our understanding of triaenonychid relationships remains uncertain, and the family's classification poorly defined. 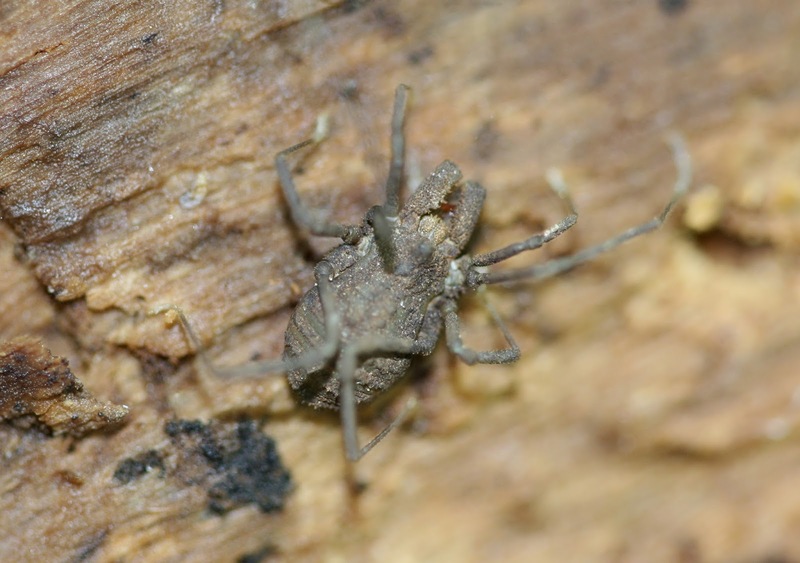 Within their range in Africa, Australasia and South America, triaenonychids can easily be distinguished from most other families of short-legged harvestmen by the structure of the claws on the hind two pairs of legs. Whereas members of other families bear a pair of simple claws on these legs, triaenonychids have a single claw with side branches on each leg. Branched claws are also found in the New Zealand genus Synthetonychia, which occupies its own distinct family, but that genus is easily recognised by its unusual body shape without a distinct eyemound. The Gondwanan Triaenonychidae were divided by Roewer into three subfamilies (Triaenonychinae, Triaenobuninae and Adaeinae) based on the shape of the sternum (the plate running along the underside of the body between the leg coxae). The significance of this feature was later questioned by Forster (1954) who recognised two subfamilies Triaenonychinae and Soerensenellinae on the basis of claw morphology (soerensenellines having longer side branches on the claws than triaenonychines) and reduced Roewer's subfamilies to tribes of Triaenonychinae. No large-scale analysis of triaenonychid phylogeny has been done so far, so it remains unestablished whether we should prefer one classification or the other (or possibly neither). 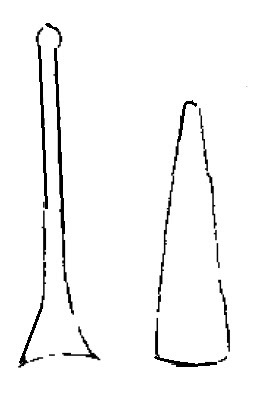 Typical triaenonychine (left) and adaeine (right) sternal shapes, from Forster (1954). 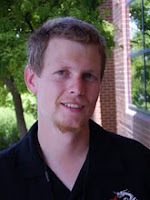 The Adaeinae or Adaeini may be one of the better defined of Roewer's original subgroups and recent authors have expressed the opinion that this may indeed turn out to be a natural clade. Whereas members of the Triaenonychinae sensu stricto and Triaenobuninae have a sternum that has a spearhead-shaped expansion at the front end and a broadened base at the back, members of the Adaeinae have a sternum that is a triangular or wedge shape without a posterior expansion. The adaeines are likely to be endemic to southern Africa; Kury et al. (2014) did list a single Australian species, Dingupa glauerti, in the Adaeinae but I would hazard a guess that future study proves this species to be misplaced (as has been found with other Australasian 'adaeines'). About forty species of adaeines are currently recognised, all from South Africa, but it is entirely likely that more remain to be described. 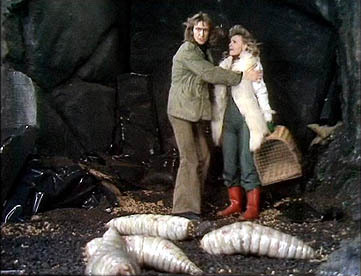 The hard, granular body surface of adaeines inevitably picks up a covering of dirt and grit, making them exceedingly difficult to spot when not moving. Nevertheless, adaeines can be quite large as harvestmen go, with some being up to a centimetre in body length. Conversely, Micradaeum rugosum, a species found in the vicinity of Cape Town, is only about three-and-a-half millimetres in body length (Lawrence 1929). As with other species of Triaenonychidae, the large, raptorial pedipalps are larger and more robust in male adaeines than in females, and often have more pronounced spines. In some species of the genus Larifuga, nowever, spines or denticles may be more prominent on the female's pedipalps than on the male's, though the male's pedipalps are still larger and stronger overall (Lawrence 1937). Forster, R. R. 1954. The New Zealand harvestmen (sub-order Laniatores). Canterbury Museum Bulletin 2: 1–329. Lawrence, R. F. 1929. The harvest-spiders (Opiliones) of South Africa. Annals of the South African Museum 29 (2): 341–508. Lawrence, R. F. 1937. The external sexual characters of South African harvest-spiders. Transactions of the Royal Society of South Africa 24 (4): 331–337, pls 14–15.